We surveyed nearly 9000 marketers about their Black Friday and Cyber Monday marketing strategy. What we learned can help you, too. At ShortStack, we’re always analyzing our users’ campaigns to see what makes some more successful than others so we can share what we learn. Some of what we see is really obvious — embedded campaigns get more traffic than those published only to Facebook, and offering a relevant prize gives any contest more momentum. But other times, we notice subtle things our users are doing to make their efforts more successful. For example, in early October we surveyed 9,000 ShortStack power users and learned that 54 percent of them already had a Black Friday / Cyber Monday promotion strategy ready to go. Of that group, 93 percent are using, or plan to use, three to five tactics to execute their promotion strategy. The tactics include hosting contests/giveaways, email marketing, advertising, and offering discounts/coupons. In other words, brands promoting Black Friday / Cyber Monday deals, recognize the power of “omnichannel” marketing. And that’s smart! Employing a variety of tactics allows you to cover many bases. The customer who ignores your catchy subject line in their email inbox might not be able to resist clicking on your clever ad in their Facebook feed. Another interesting statistic we found? Eighty-six percent of the marketers with a Black Friday / Cyber Monday promotion plan in place are running a contest or giveaway. Although interesting, it’s not surprising that contests and giveaways are among the most popular marketing efforts from the five listed above. Data is essential to understanding how to market to your audiences. And running a contest or giveaway can get you lots of useful information. An obvious example of this would be the data you collect in your entry form (e.g., name, email address, etc.) but there are so many other things you can learn about your customers based on the type of contest or giveaway you run. For example, check out the “Pick Your Prize” giveaway below. Participants can choose from a few different prizes letting you know what products they’re interested in, and also which of your products might be the most popular. If an ad is equivalent to your basic commuter sedan, a giveaway is like a turbo Porsche. Say you’re in the market to buy a new power drill. Would you rather click on an ad boasting “15% off power tools,” or an ad linking you to a giveaway in which you can win a whole set of power tools and get a coupon for 15 percent off (sent in an email autoresponder) to shop with even if you don’t win. Contests serve the same function as ads, with added layers of excitement, engagement, and follow up. In a comprehensive promotion strategy, you can use a contest or giveaway as a hub, driving traffic to or from landing pages, ads, emails, etc. To get more sales in your online store. 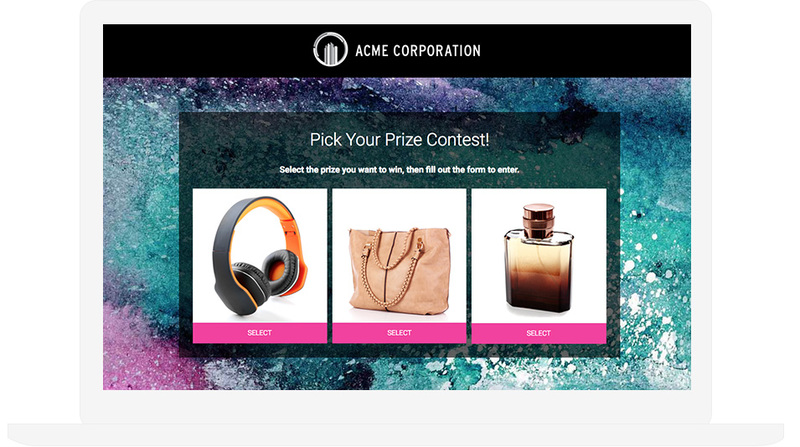 Someone clicks on an ad, the ad directs them to a contest or giveaway, the entry to said giveaway triggers an email autoresponder with a discount code or coupon. 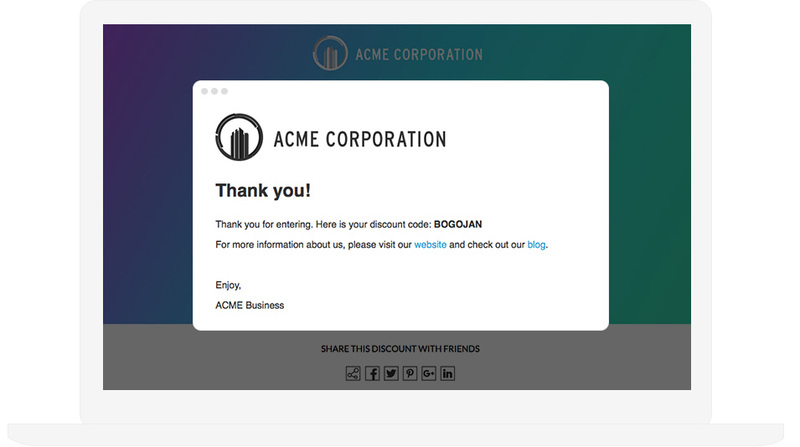 The email autoresponder can also link to an online store where they can use the discount code. If the holidays are your business’s time to shine, a contest or giveaway run during this time of year can get you the most engagement. Use the data you collect to keep the momentum up all year long with a tactic such as running retargeting ads. Did you run a “Pick Your Prize” giveaway like the one shown in the example above? If you found half of your audience chose a specific prize, you could run an ad featuring that particular product and target it to those people. Did you collect a bunch of email addresses with your contest or giveaway? Those emails are targeted leads you can use to market future promotions to. Read how Star Fine Foods increased their web traffic by 288 percent after their holiday campaign had ended. Also, check out this resource with “9 strategies to leverage the data you collect during the holidays,” all year long. If you find you get more sales throughout the holiday shopping season than on Black Friday / Cyber Monday alone, running a promotion during the Black Friday weekend is a great way to tweak tactics, copy, audience targets, etc. and then hone your efforts for the rest of the month. If you’re serious about tapping the potential of the biggest shopping weekend of the year, don’t be a benchwarmer! Want more tips for getting the most out of the Black Friday / Cyber Monday frenzy? Use these 3 keys to using data driven marketing.